A stay of approx. 2 –3 hours in total would enable a child to experience each of the task centers. How many stumps can you step on that come up out of the floor? They’re only out of the floor for a fraction of a second so you’d better be quick. Work with a partner. Race the clock. 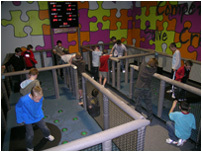 Compete against other kids in other zones to try and beat their score. The game runs for 2.5 minutes so you better have a lot of energy to beat the ‘Best Ever Score’!! One large area is divided into 4 zones. Each zone is ‘see-through’ and contains 1-4 children. Children take turns to stomp on dome ‘stumps’ that randomly pop out of the floor and stay out for a fraction to a few seconds each. You compete against the clock and the other children in the other zones. A large overhead scoreboard shows the results for the 4 zones. 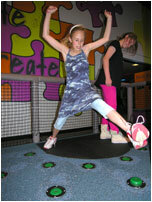 All zones are independently controlled and can be set for pre-schoolers to adults. To reduce the risk of injury all zones are fully padded with appropriate material and children are not permitted to sit or climb on the structure.